In a sad but true twist of my week, it is yet Thursday again. The fact that it is Thursday means I have to face up to the fact that tonight I have night school and I have yet again failed to do my homework. (Wait a second...does that make me a teacher's worst nightmare?) I do have plenty of great excuses though. No seriously. It's tax season and I have been doing tons of research trying to find some answers for a complicated return. I was really ready to go into hiding to avoid having to deal with it at all, when in a final fit of desperation I decided to give the IRS a call. After several transfers I finally ended up with a "complicated" (boy did they name that department aptly) operator. In less than a minute John had solved the most complicated tax situation I have yet to encounter. After an initial gush of thanks, I started to feel a slight trickle of a tear starting to stream down my face. Then I decided it would probably be much too awkward for the both of us if I started to cry on the phone. Instead I hopped and skipped into the kitchen to make some cookies. I'm hoping to offer them to my night school teacher as a bribe peace offering for being her worst student ever. Combine butter, sugar, egg, flour, salt, baking soda, lemon zest, and lemon juice in a bowl and mix until combined. Combine sugar and lemon zest in a food processor and pulse a couple of times until well combined. Pour into a small bowl. Shape the cookie dough into balls about 1 1/2-inch around and roll the balls into the lemon-sugar. 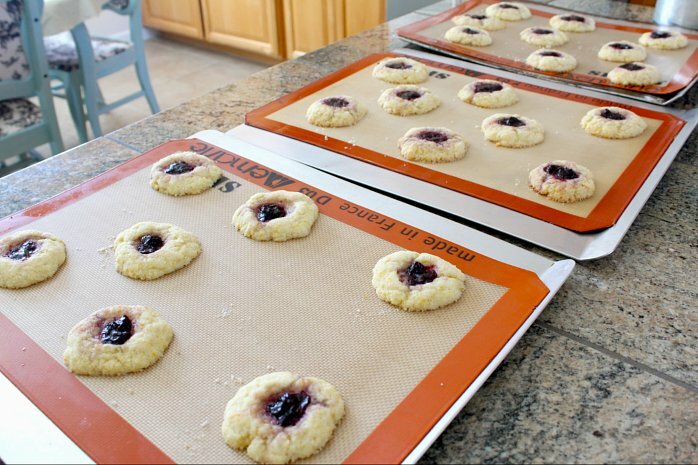 Place the balls a couple inches apart onto cookie sheets lined with silpats or parchment paper. Press a dent in the middle of each ball with your thumb and fill with 1/4 teaspoon or so of blueberry jam. The blueberry jam bleeds a bit on the dough, perhaps not making for the prettiest of cookies. These ugly ducklings were a serious flavor explosion though more than making up for any lacking in the looks department. I know what you guys are thinking, "this lady eats nothing but desserts". While on occasion that's true, but I do try and eat healthy occasionally. Today for lunch I had a super tasty veggie wrap. On a pretty tasty tortilla I might add. I'd totally drop the name of them for you if I had been gifted these. For some reason, I just don't get sent the free stuff. Hmm, pretty sure it has nothing to do with my About Me page. I am so making these cookies! I love the taste of lemon and blueberry together, plus it looks like such an easy recipe to make. If I was your teacher, I'd be happy! Hi Gina, I love these thumbprint cookies. Definitely love to make these cookies for sure as my family loves cookies! I usually only make thumbprint cookies, but I'll be making these soon. Scott loves anything lemon, and lemon and blueberry are such a great combo. Nom-nom...those looks so good and must make soon! Great post and yummy recipe! Have a lovely weekend Gina! I love thumbprint cookies, they are so pretty. And there are so many variations to play with. Lemon and blueberry - love it! Thumbprint cookies are always so much fun! And lemon is one of my favorite flavors, so you have my attention. Plus it plays so well with blueberry. You should avoid doing your homework more often! ;-) Good stuff - thanks. Whew, so glad the tax question was solved! Hope by now it's all out of the way and a distant memory. And what teacher could refuse these cookies? Sure beats an apple!! !